The country is in desperate need for some good news, so is the agricultural sector. The past season was one of contrasts. Dry in the Western Cape and wet in the North. The Western Cape is struggling especially in the Swartland area. The Southern Cape had quite a few good to very good seasons preceding this average one. In the North we have experienced what the real potential of the varieties are. Record yields were recorded, but the Bank Managers are very difficult as the prices dropped below the cost of producing the grains. One keeps on asking the question as a farmer: What am I to do in these type of extreme circumstances? There are no quick answers to these questions. The South African grain farmers have proven their resilience over many years. Resilience is the ability to hang in there when things get tough, to find new solutions to the current problems. Thus, my first piece of advice for 2018 is to keep on trying new things that can bring sustainability to your farming operations. Vasbyt! The second thing is to make a sum before you start buying, planting and marketing. There are still too many stories of grain farmers just starting up their tractors to plant without making the books balance. Sustainability is about making profits to generate new capital for expansion and upgrade of your current technologies. Make sure you get good advice from your input providers as well as seasoned grain farmers that have been through more than one drought or crises. The Grain SA platforms (study groups, magazines and mentors) are ideal for this purpose. Nobody will keep good advice away from those that enquire. For 2018 the Grain SA team will continue to invest more funds and energy into research to find solutions for the current challenges especially around climate change. We will monitor whether the Fall Army Worm (FAW) will again pester our crops in the summer. We did not find any traces in the Western Cape during the growing season. Our partnership with the Department of Agriculture, Forestry and Fisheries is of note here. Our efforts to get the financial institutions to avail production loans to our farmers remain very high on the agenda and it seems as if our Farmer Leaders need to engage the political leaders on this matter to get any meaningful results. Despite all the difficulties of 2017, let’s do our utmost to make use of the opportunities given by God in the New Year. I am optimistic that God will hear our prayers not just for our farms, but also for our beloved country. Grain SA wishes you a productive and prosperous season in 2018. 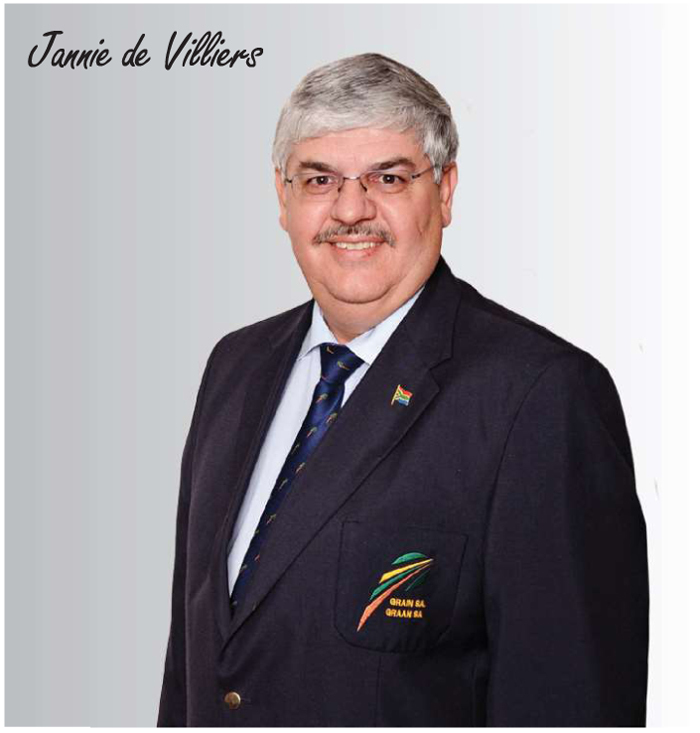 Article submitted by Jannie de Villiers, CEO of Grain SA. For more information, send an email to jannie@grainsa.co.za.